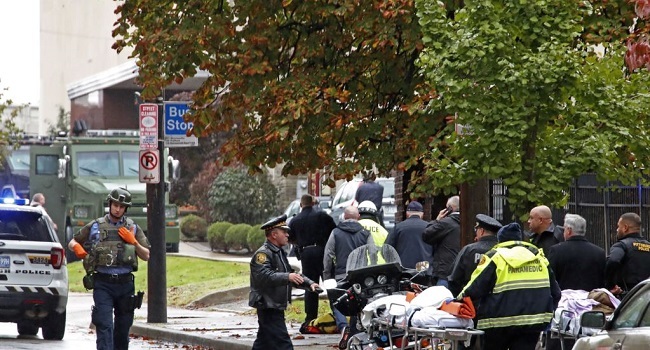 A man armed with an assault rifle and three handguns who stormed the Tree of Life Synagogue in the Squirrel Hill neighbourhood where he shot and killed 11 victims and injured six others including four police officers, has been taken into custody. KDKA said the suspect in custody was a "white male". A law enforcement official, who spoke to The Associated Press news agency on condition of anonymity, identified the detainee as Robert Bowers, a man in his 40s. According to the city’s public safety director, Wendell Hissrich, the attacker was leaving the crime scene when he met an officer who shot at him in a gun duel. Hissrich said Saturday’s suspected attacker was at a hospital in fair condition but with multiple gunshot wounds.